Despite the risks demonstrated in the Ukrainian attack, the DHS assessment from January tries to downplay the threat posed by state actors, noting that 63 percent of malicious cyber activity in FY 2014 was “unattributed, low-level activity” related to cybercrime using methods such as ransomware and denial-of-service attacks. 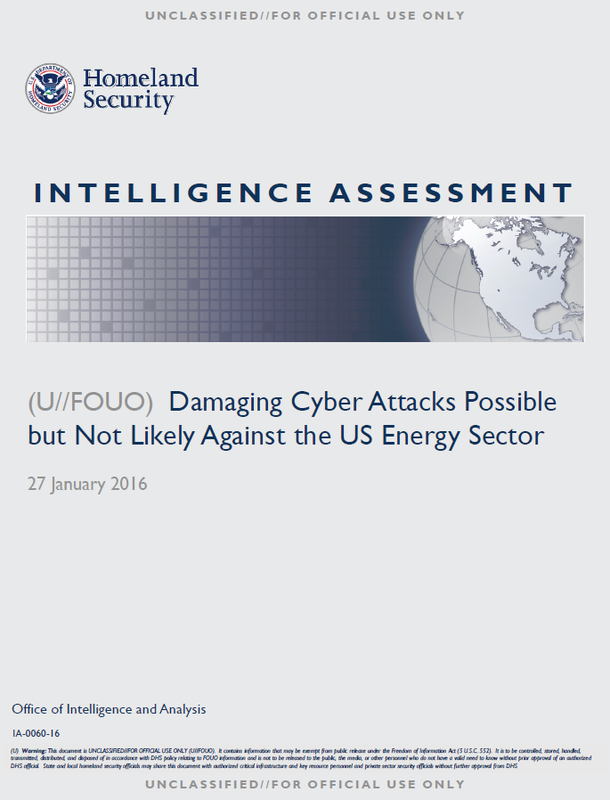 The assessment’s authors also include a section criticizing the media’s over-hyping of cyber attacks and cyber warfare as leading to “misperceptions about the cyber threat to the US energy sector.” The term “cyber attack” is often used by the media and private sector to refer to incidents and activities that are not necessarily intended to “cause denial, disruption, destruction, or other negative effects” which would better be described as “cyber espionage, and even low-level, untargeted incidents of cybercrime.” The assessment even speculates that overuse of the term could lead to “alarm fatigue” which could lead to less reporting of incidents and longer response times. 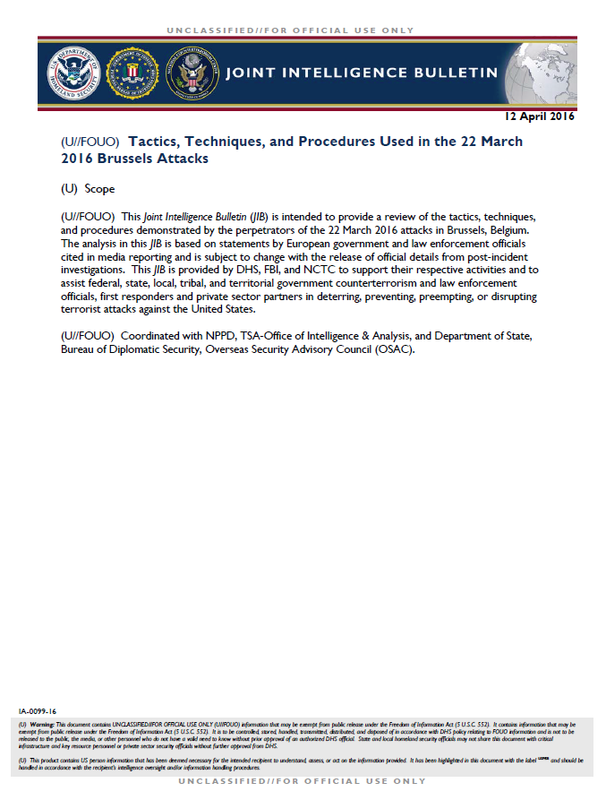 (U//FOUO) This Joint Intelligence Bulletin (JIB) is intended to provide a review of the tactics, techniques, and procedures demonstrated by the perpetrators of the 22 March 2016 attacks in Brussels, Belgium. The analysis in this JIB is based on statements by European government and law enforcement officials cited in media reporting and is subject to change with the release of official details from post-incident investigations. This JIB is provided by DHS, FBI, and NCTC to support their respective activities and to assist federal, state, local, tribal, and territorial government counterterrorism and law enforcement officials, first responders and private sector partners in deterring, preventing, preempting, or disrupting terrorist attacks against the United States. (U//FOUO) We judge the Brussels attackers probably conducted preoperational surveillance, did some level of tactical planning, and had familiarity with the targets prior to the attack, but may have expedited their plans after the arrest—several days prior in Belgium—of the sole surviving attacker involved in the November 2015 Paris attacks. We further assess the large amount of explosives used, willingness to operate despite well-publicized efforts by security officials to locate potential ISIL operatives, and the use of operational security to avoid law enforcement detection during the preoperational phase indicate some level of training. The attackers were part of an extensive support network and infrastructure in Belgium that also conducted the Paris attacks. This same network may have allowed the operatives to acquire materials and false documents, fabricate explosives, and may have facilitated connections with individuals based in Syria. (U//FOUO) Attack Overview: On 22 March 2016, at least four and as many as five operatives divided into two teams that detonated homemade explosive devices estimated to contain between 30 and 60 pounds of triacetone triperoxide (TATP) at Brussels Zaventem International Airport and onboard a train in the Brussels subway, killing at least 32 and injuring over 300. Two operatives at the airport and one individual at the metro conducted suicide operations, which also resulted in over a dozen American casualties, including at least two deaths. Belgian authorities have arrested a man believed to be the third operative seen in CCTV footage at the airport and are investigating the possibility of an accomplice at the metro prior to the explosion. (U) Airport Attack: At approximately 0758 local time, two improvised explosive devices (IEDs) believed to have been concealed in luggage detonated seconds apart in the passenger check-in area for several international airlines, including a US carrier. The attackers did not attempt to enter areas where their bags would be subject to security screening. Authorities later found a third viable device at the airport, which Belgian officials speculate might have been designed to target first responders, according to a statement from the Belgian federal prosecutor to the press. The device was later detonated by explosive ordnance disposal technicians. The third alleged operative at the airport was seen in security footage with the two suicide operatives in the moments prior to the attack, but he fled the scene and was arrested by Belgian authorities on 8 April. (U) Subway Attack: Approximately 80 minutes after the airport explosions, at 0910 local time, an explosion occurred on a train as it departed the Maelbeek metro station, killing 13, according to the Brussels transit operator STIB. At least one operative, possibly aided by a second operative, entered the Maelbeek metro station and boarded the middle car of the three-car train, according to Belgian officials cited in media reporting., The blast occurred during morning rush hour near the European Union buildings, raising the possibility the operatives were targeting European government employees. (U//FOUO) We encourage reporting of suspicious activity to appropriate authorities and encourage our homeland security, military, law enforcement, first responders, and private sector partners to remain vigilant. We face an increased challenge in detecting in-progress terrorist plots by individuals or small groups acting quickly and independently or with only tenuous ties to foreign handlers. Pre-operational indicators are likely to be difficult to detect; therefore, state, local, tribal, territorial, and private sector partners play a critical role in identifying and reporting suspicious activities and raising the awareness of federal counterterrorism officials. (U//FOUO) The acquisition of materials for constructing an explosive device, a necessary stage in the execution of any IED attack, offers an opportunity for detection and disruption of plots. Thus, it is critical that point-of-sale employees understand how their products can be misused and are trained to recognize indicators of suspicious purchases and methods of reporting this information. » (U//FOUO) In May 2015, a tip by a vigilant hardware store clerk to local police about a potentially suspicious purchase of an explosive precursor led German authorities to foil a possible attack against a major sporting event in the country after a couple purchased an unusually large amount of hydrogen peroxide. German authorities later discovered the couple presented fraudulent credentials and were associated with the local violent extremist community in Germany. » (U//FOUO) The FBI arrested Saudi national Khalid Aldawsari in late February 2011 after he attempted to purchase a highly concentrated phenol solution—a precursor for the explosive trinitrophenol or picric acid—and raised suspicions of a freight company in Texas after the delivery of an unexpected package from a North Carolina chemical company. Aldawsari attempted to bypass the chemical company’s restriction on sending shipments to an individual or a residence, but he did not have permission from the freight company to have the package delivered. Aldawsari was sentenced to life in prison in June 2012 for attempted use of a weapon of mass destruction, according to a January 2014 FBI press release from the US Court of Appeals affirming his conviction. (U) Homeland Security Reference Aids, prepared by I&A, provide baseline information on a range of homeland security issues. 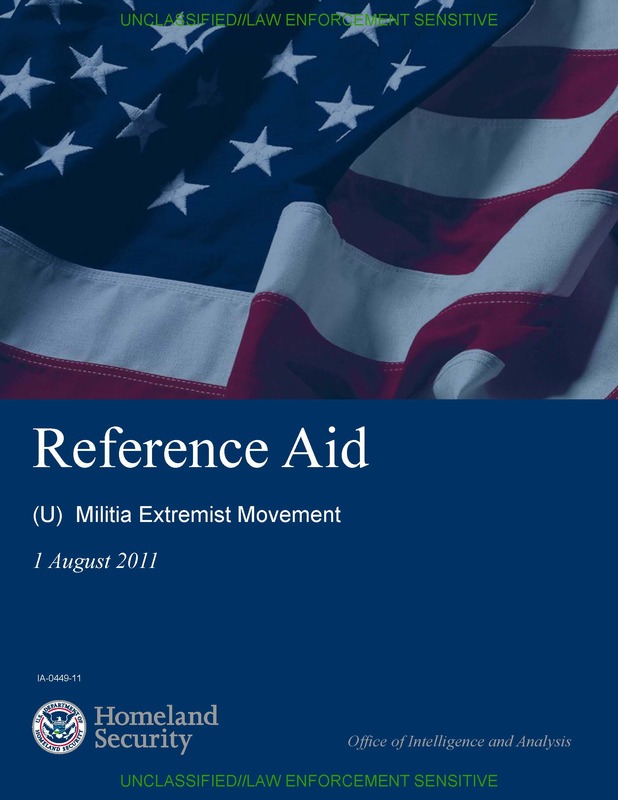 This product is one in a series of reference aids on violent domestic and foreign extremist groups that assess the nature and scope of the threat they pose to the Homeland. This product is intended to support federal, state, local, and tribal agencies and authorities with responsibilities relating to homeland security to assist in the deterrence, prevention, preemption of, or response to terrorist attacks against the United States. To maintain timely and accurate intelligence, DHS encourages state and local law enforcement to respond with any updated information they may have concerning the status, composition, or activities of violent extremist groups in their jurisdictions. (U//FOUO) The violent militia extremist movement in the United States is comprised of a collection of distinct, but organized, paramilitary groups that have engaged in violent criminal activities and terrorism-related plots to advance their anti-government beliefs. Individual violent militia extremists have been convicted of a range of firearms and explosives violations and criminal conspiracy charges. The violent militia extremist movement is a subset of the larger militia movement; many groups and individuals involved in the overall militia movement do not commit criminal or violent acts. (U//LES) The violent militia extremist movement peaked in membership in 1996 and then steadily declined due to negative publicity after it was erroneously linked to the Oklahoma City bombing and as a result of increased law enforcement scrutiny. After several years of significant decline in membership and violent criminal activity, the violent militia extremist movement has rebounded in the past few years as new groups have formed and new recruits have joined its ranks. (U//FOUO) The militia movement in the United States formed circa 1994 in response to the perceived unwarranted and overzealous aggression of federal authorities at Ruby Ridge, Idaho in 1992 and Waco, Texas in 1993. The movement’s violent fringe element emerged shortly afterward. During the mid-to-late 1990s, several violent militia extremists were arrested and ultimately convicted of multiple plots to bomb federal buildings, military bases, highways, bridges, and other infrastructure in the United States. More recently, several violent militia extremists have been arrested for possessing illegal firearms and explosives and plotting to kill law enforcement officers. (U//FOUO) Factions within the larger militia movement and its violent fringe element often form, disband, or change names in short periods of time and are rife with internal turmoil stemming primarily from disagreements among leaders over missions, focus, and training. Militia members maintain the ability, however, to organize meetings and train within a particular militia group in their own state and to network with other militia groups in neighboring states. Despite the turmoil, some violent militia extremist groups and individuals have demonstrated the ability to instigate and support violence that targets government officials, institutions, and facilities in the United States. (U//FOUO) Violent militia extremists oppose most federal and state laws, regulations, and authority. Violent militia extremists have also been known to adopt anti-government belief systems found in the violent sovereign citizen and white supremacist extremist movements and form violent militia extremist groups based on this ideology. (U//FOUO) Violent militia extremists often combine their antigovernment beliefs with various conspiracy theories. Some tout the existence of a despotic “New World Order” (see text box) or cite apocalyptic or “end times” beliefs to support their outlook. Individuals within both the nonviolent elements of the militia movement and the more violent extremist minority profess that militias are the last line of defense in protecting US constitutional freedoms against a federal government that they see as increasingly eroding citizens’ personal rights, property rights, and the right to own firearms. (U//FOUO) This conspiracy is described by militia members as a plot by a secret cabal of powerful individuals whose alleged goal is to create a one-world socialist government under the auspices of the United Nations. The US Government is seen as collaborating with the New World Order to strip Americans slowly of their freedoms in the takeover, which allegedly would involve establishing large numbers of detention camps for American dissidents. (U//FOUO) Violent militia extremists have co-opted several common symbols that represent patriotism and a willingness to defend oneself against a tyrannical government. The most popular symbols include a Minuteman holding a rifle with the words “honor,” “defend,” and “liberty,” and the Gadsden Flag with the words “Don’t Tread on Me.” The Minuteman logo is a reference to the American colonial militia that battled British troops during the American Revolutionary War and symbolizes patriotism and militia successes during the war. The Gadsden Flag emerged as a symbol of the colonies in their fight against the British military during the American Revolutionary War. Both the Minuteman symbol and Gadsden Flag image are used widely outside the violent militia extremist movement, and the presence of these symbols alone does not necessarily indicate an association with a violent extremist militia. (U//FOUO) Scope: This Field Analysis Report (FAR) is designed to support awareness and inform enforcement and collection operations of federal, state, and local partners involved in homeland security and counterterrorism efforts. Some of the activities described in the FAR may be constitutionally protected activities and should be supported by additional facts to justify increased suspicion. The totality of relevant circumstances should be evaluated when considering any law enforcement response or action. 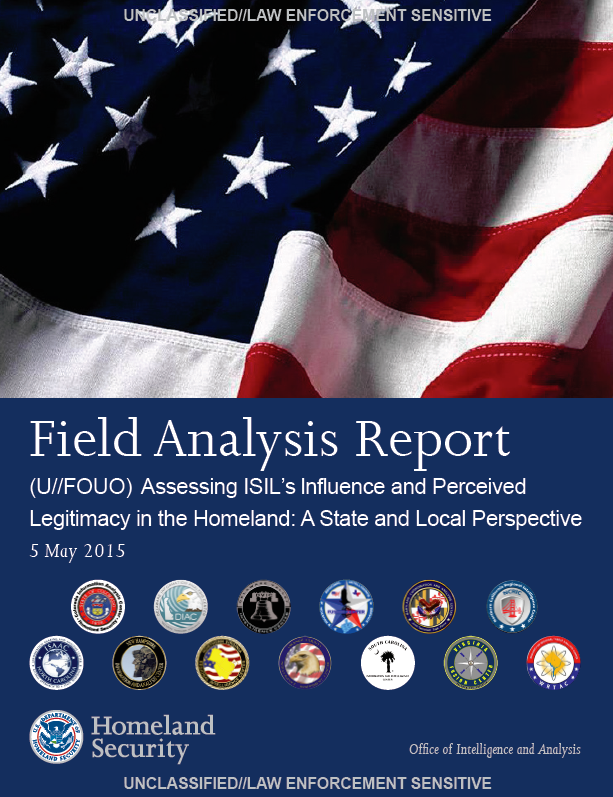 Our assessment of the level of the Islamic State of Iraq and the Levant’s (ISIL) name recognition since its declaration of a caliphate in June 2014 is based on a review of suspicious activity reporting (SAR) across the United States between 1 January and 30 December 2014, criminal complaints of US persons charged with supporting or seeking to support ISIL, Bureau of Prisons (BOP) intelligence reporting, and DHS I&A open source reporting to assess the influence of ISIL’s messaging campaign within the United States and ISIL’s perceived legitimacy among homegrown violent extremists (HVEs). (U//LES) We assess an increased volume of ISIL-related SARs between June 2014 and January 2015 signifies the penetration and recognition of its brand because much of this reporting centered on ISIL symbols, imagery, and support for the group voiced on social media. (U//FOUO) We judge––based on the body of SAR, criminal complaints, BOP reports, and open source reporting consulted throughout this FAR (see Scope and Source Summary Statements)––that ISIL’s messaging is resonating with US-based violent extremists due to its championing of a multifaceted vision of a caliphate that prioritizes a wide array of justifications and obligations for support, especially compared to other terrorist groups with whom it competes for support, like al-Qa‘ida (AQ) and its affiliates. ISIL’s messaging is amplified through a sophisticated use of social media tailored to a global audience. (U//LES) A high volume of SAR reporting—of varying degrees of potential threats—associated with ISIL will likely persist as long as ISIL sustains its messaging campaign and perceived military and governance successes, specifically so long as it is perceived to successfully defend its self-declared caliphate. (U//FOUO) We assess ISIL’s name recognition is built in large measure on its military successes and rapid territorial gains in Syria and Iraq in 2014. The allure for potential HVEs also rests with ISIL’s carefully constructed image, based on the perceived legitimacy of its self-proclaimed re-establishment of the caliphate, governance efforts according to their interpretation of Islamic law, and ability to project power through continued expansion—all conveyed via a highly organized messaging effort. The prevalence of media coverage surrounding ISIL’s exploits challenges our ability to isolate and assess how central a role ISIL-directed messaging, amplified by individuals who share that messaging online though their individual social media platforms, plays in influencing demonstrations of ISIL support in the United States. (U//FOUO) ISIL espouses a violent extremist counterculture and vision focused on the expansion of its self-proclaimed caliphate. This approach is at odds with the model traditionally espoused by AQ, which focuses on driving perceived Western aggressors from Muslim-majority countries through terrorist attacks in the West, before conquest of a state or establishment of a caliphate. The ISIL narrative includes a positive vision—in the eyes of its members—of an alternative political system that is to be established now, as opposed to at some point in the distant future. (U//FOUO) As a consequence, a broader and more diverse pool of individuals in the United States, including females, may identify strongly with aspects of ISIL’s narrative—including governance under a particular vision of Islamic law, the re-establishment of the caliphate, the purported obligation upon Muslims to emigrate once it is formed, and the defense of Sunni Muslims against the Syrian regime’s persecution. These elements of ISIL’s narrative do not resemble goals long prioritized by AQ via its English-language messaging. We judge ISIL’s self-purported success as a functioning and viable state responding to US-led coalition attacks helps legitimize—to some individuals—its use of terrorist tactics to defend itself against perceived Western aggression. (U//LES) The volume of ISIL-related SARs increased sharply in the second half of 2014, according to queries of state, local, and federal holdings nationally. Chronologically, this uptick corresponds with ISIL’s military successes, self-declared re-establishment of a caliphate, and increased English-language messaging—along with increased media coverage of these exploits. Any single incident of suspicious activity, in isolation, may constitute constitutionally protected activity and does not necessarily indicate an intent to mobilize to violence or provide material support to ISIL. Nevertheless, as a body of reporting showing a trend, we judge the increase in SARs signifies a penetration of ISIL’s messaging into the Homeland. (U//LES) Several incidents related to ISIL graffiti, symbols, or ISIL-related paraphernalia—including clothing, patches, and flags––were reported to law enforcement agencies. Additional examples of graffiti, in Arabic and English, stickers with ISIL emblems, and similar imagery have been reported in the United States. A group was arrested in France in November 2014 for selling ISIL paraphernalia to US-based individuals and other customers, according to open source reporting. An intelligence assessment from the Department of Homeland Security demonstrates law enforcement’s growing fear of violence from “anti-government” extremists emboldened by the recent standoff at the Bundy Ranch in Nevada. An intelligence assessment released July 22 by the Department of Homeland Security Office of Intelligence and Analysis warns of an increasing trend of “anti-government violence” from what are described as “domestic violent extremists” inspired by the recent standoff at the Bundy Ranch in Bunkerville, Nevada. The report, titled “Domestic Violent Extremists Pose Increased Threat to Government Officials an Law Enforcement,” was originally obtained and published by Public Employees for Environmental Responsibility, a non-profit alliance of local state and federal resource professionals that has been advocating for criminal charges against Cliven Bundy and “militia snipers” involved in the April standoff with the Bureau of Land Management. In recent months, the report suggests that there has been a notable increase in violence from domestic extremists motivated by “anti-government ideologies.” Compared to the previous four years, DHS assesses that the “perceived victory by militia extremists in a show of force against the Department of Interior’s Bureau of Land Management (BLM) will likely inspire additional anti-government violence over the next year.” The report reflects a current trend in the national law enforcement community that views the rise of domestic extremist groups, variously referred to as militia or anti-government extremists as well as sovereign citizens, as a significant threat to the safety of government officials, law enforcement and first responders. In fact, a recent survey conducted by the National Consortium for the Study of Terrorism and Responses to Terrorism (START) at the University of Maryland found that law enforcement throughout the country identifies sovereign citizens as the top terrorist threat, greater even than the threat posed by Islamic extremists. (U//LES) I&A assesses that the belief among militia extremists that their threats and show of force against the BLM during the April Bunkerville standoff was a defining victory over government oppression is galvanizing some individuals-particularly militia extremists and violent lone offenders-to actively confront law enforcement officials, increasing the likelihood of violence. Additionally, this perceived success likely will embolden other militia extremists and like-minded lone offenders to attempt to replicate these confrontational tactics and force future armed standoffs with law enforcement and government officials during 2014. March 2011 – Four members of the militia extremist group The Alaska Peacemakers Militia (APM) – including its leader – were arrested in March 2011 for conspiracy to kill judges and law enforcement. APM’s leader was sentenced in January 2013 to 26 years in prison. Three other members received sentences of 26, 12 and 5 years, respectively. November 2011 – Four militia extremists were arrested in November 2011 for planning to obtain explosives, guns and a biological toxins for attacks against government personnel, including employees of the Internal Revenue Service, the Bureau of Alcohol Tobacco Firearms and Explosives and local law enforcement. Two were convicted in 2012 for plotting to obtain explosives and two were convicted in 2014 for plotting to obtain the toxins. December 2011 – Georgia-based US Army soldiers – arrested in December 2011 – were convicted in 2012, 2013 and 2014 for involvement in a homicide to cover up the plans of their militia extremist group called F.E.A.R. (Forever Enduring Always Ready) that plotted to attack government and critical infrastructure targets including a hydroelectric dam and Ft. Stewart military base. According to court documents, the individuals allegedly stockpiled over $87,000 in firearms and bomb-making components. November 2013 – An armed lone offender extremist with an anti-government ideology entered Terminal 3 of LAX on November 1, 2013 and proceeded to the security screening area where he opened fire with an AR-15 style assault rifle. The gunman subsequently shot and killed one TSA Transportation Security Officer (TSO) and wounded two other TSOs, plus a civilian. Another individual was injured fleeing the scene. The suspected gunmen was wounded and is awaiting trial. February 2014 – Three militia extremists in February 2014 were arrested by federal law enforcement attempting to buy explosives in furtherance of a plot to allegedly attack the electrical grid and government targets, including DHS personnel and facilities. They are awaiting trial. 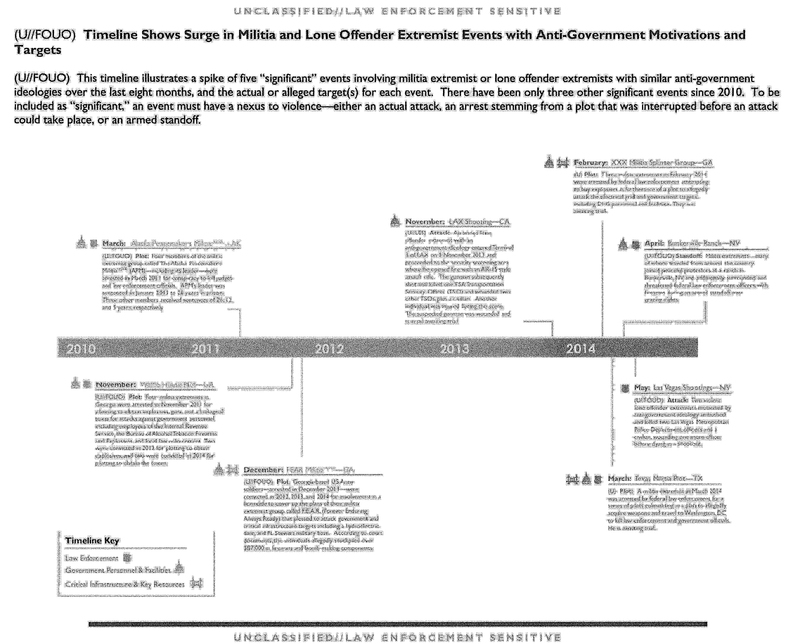 March 2014 – A militia extremist in March 2014 was arrested by federal law enforcement for a series of plots culminating in a plan to allegedly acquire weapons and travel to Washington, D.C. to kill law enforcement and government officials. He is awaiting trial. April 2014 – Militia Extremists – many of whom traveled from around the country – joined peaceful protesters at a ranch in Bunkerville, NV and additionally surrounded officers with firearms during an armed standoff over grazing rights. June 2014 – Two violent lone offender extremists motivated by anti-government ideology ambushed and killed two Las Vegas Metropolitan Police Department officers and a civilian, wounding one more officer before dying in a shootout. Last August, the FBI’s San Antonio Division issued a bulletin stating that a Sovereign Citizen group was organizing youth groups to participate in door-to-door fundraising campaign with the actual intent of identifying the homes of law enforcement and first responders. The youth traveled in “small teams of at least two, traveled throughout neighborhoods knocking on doors” telling the homeowners that “they worked for a fund raising organization designed to help young individuals with public speaking.” The groups were “instructed that the information they collected counted as ‘points’” and that the “team with the most points would win a college scholarship and a large sum of money.” A yellow reference card was provided to each of the groups listing approximately fifteen professions that corresponded to a point value ranging from 500 to 2000 points. Professions listed on the card included firefighters, nurses, doctors as well as members of the military. However, the profession with the highest point value of 2000 was “police officer.” Following the release of the FBI bulletin, the New Jersey Regional Operations Intelligence Center later issued a request for information describing incidents where government officials had been threatened and instructing law enforcement to be careful when providing their personal information to unknown parties.